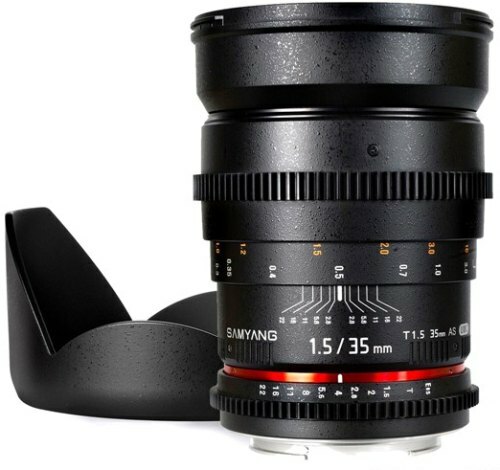 The Samyang 35mm T1.5V-DSLR Canon Lens has been optimized for movie making purposes with your D-SLR camera. 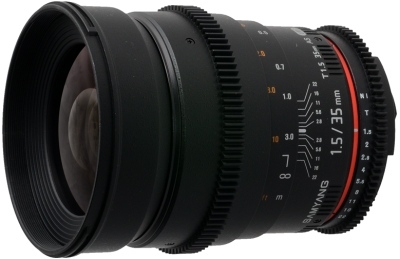 The Samyang 35mm T1.5V-DSLR Canon Lens is compatible with APS-C and Full Frame Canon cameras. The optical and mechanical construction is the same as the Samyang 35mm f1.4 lens, the only difference is that the focus and diaphragm ring can be easily and smoothly adjusted, the diaphragm has no stops, so it is very quiet. The Samyang 35mm T1.5V-DSLR Canon Lens can be used for both photo and video with your photo camera or camcorder.